IMPORTANT: Read all of the information on this page before filling out the registration form. be admitted to appear before the U. S. District Court for the District of Arizona either as a member of the bar of this court, or be admitted to appear pro hac vice. After the above prerequisites are in place, an attorney may register for access to the Arizona District Court CM/ECF system by completing an on-line registration form. Registration permits filing and retrieval of documents and constitutes consent to electronic service of documents by e-mail, as provided by the Federal Rules of Civil Procedure. Already registered with the Arizona Bankruptcy or another District court? 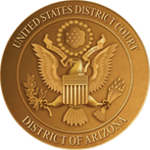 ECF accounts established in Arizona Bankruptcy or any other federal court are not valid for the Arizona District Court. A new registration with the District of Arizona is required. An attorney may register up to two additional e-mail addresses for a total of three e-mail accounts that will receive notices of electronic filing. For instance, the attorney's, an assistant's and the firm's general email addresses could all be entered in order to provide coverage for the receipt of filing notices. Federal government attorneys who are not members of the Arizona State Bar may register electronically for e-filing by placing "US" in the bar number field. Attorneys who have not previously been permitted to appear in this court may not register for electronic filing until after the court has reviewed his or her pro hac vice application. Please click here to visit the Attorney Admissions Information section for detailed instructions regarding pro hac vice. After submitting your registration on line, a confirmation e-mail will be sent to you. Your ECF login and password will be e-mailed to your primary e-mail address as entered on the registration form. The web address for the electronic filing is https://ecf.azd.uscourts.gov.